This lithograph is taken from plate 22 of 'Afghaunistan' by Lietenant James Rattray. 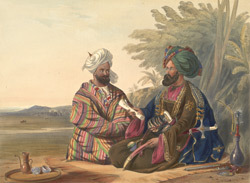 In September 1840, the British were in negotiations with Mir Wali, prince of the frontier town of Kulum, near Kunduz, so that he would transfer his allegiance to Shah Shuja. Rattray wrote: "I sketched this Uzbeg at the Fort of Lughmaunee, Cohistaun. He was an emissary from Meer Wallee, and a splendid specimen of his race." Mir Wali had received the former Emir, Dost Mohammad, and supplied him with troops in several expeditions against the British. Captain Rattray (James' brother) had been much involved in offering terms to Dost Mohammed: receiving his family and his brother Nawab Jabbar Khan as hostages and escorting them to Bamiyan.